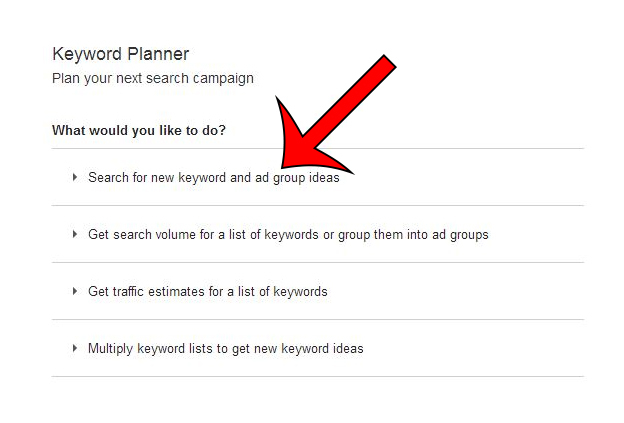 You will need a Google account to use the Keyword Planner. 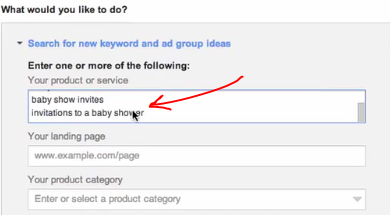 Click on the “keyword ideas” tab, and look at the keyword traffic and the keyword competition. Are there any keywords that can be bid upon, that aren’t high in competition? In fact, the left hand column, is full of filters. You can add negative keywords, or just show keywords with a certain number of searches. The far right hand column allows you to change your price range in terms of bids, and export or save your plan. You will need to name the ad group/plan first. From the keyword planner homepage. The top and second option that you can click, are basically the same but the top one gives KW suggestions. If you were to click on the 3rd option, or “review estimates” in the right hand column; you’ll get traffic estimates, based on different bid amounts. This tool helps you create a whole bunch of new keywords, from a list. You use it to take individual words, different names of your products for example, and singular and plurals etc, and get keyword lists. If you are looking for a comprehensive keyword list. UberSuggest is also very good. Re-run the planner and get more keywords. You can also use permutationer.com to get different variations of phrases. 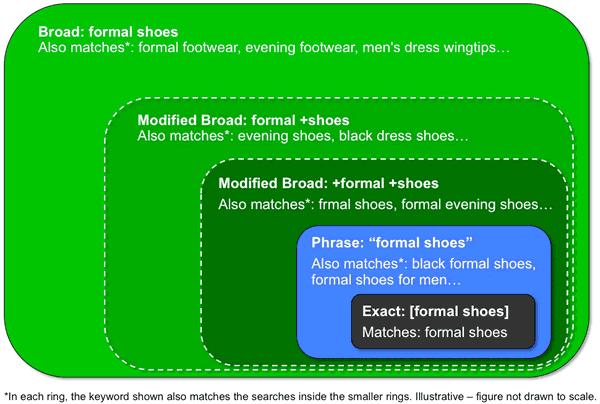 Ideally, you should experiment with Exact, Phrase and Broad match keywords. Exact Match – [Whey Protein] only includes “whey protein”, no words in between, before or after. 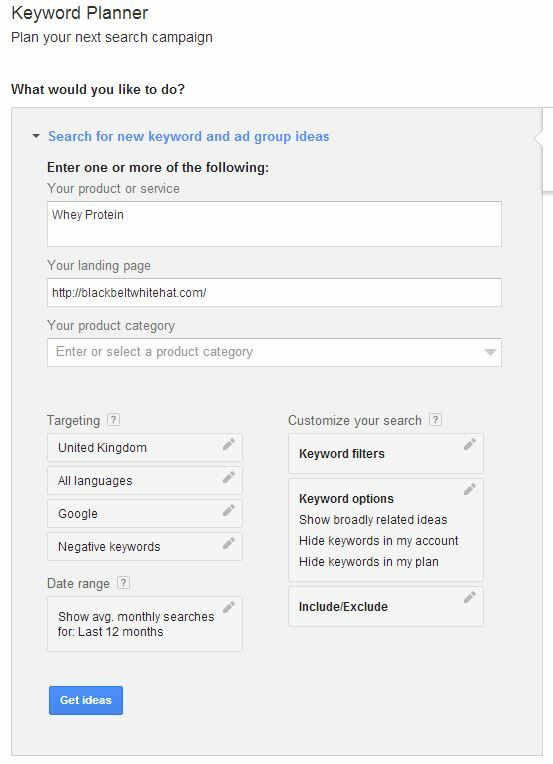 Phrase Match -“Whey Protein” Google will serve your ad for searches that contain the keyword phrase and close variations. The keyword “Whey protein” in this example, has to appear somewhere in the search query. 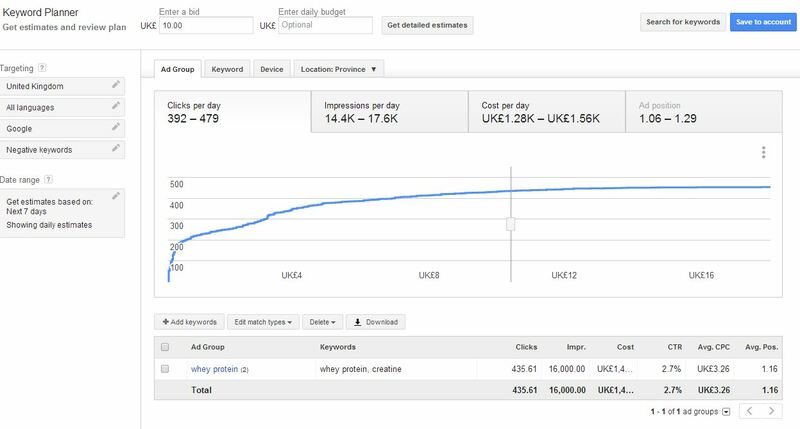 Modified Broad Match – +Whey +protein – this applies to Google adwords/PPC only. It will serve your ad when somebody searches for close variations of your keyword, but not synonyms or related searches. +whey +protein would mean that “whey” and “protein” (or a very close synonym) must be in the user’s search term for it to trigger your ad. Best practice appears to be – implement all match types initially, then find which type performs best for your own adwords groups. Quality score is a fundamental aspect that can determine the success or failure of a campaign, but also something that is, kind of, within your control. The score is out of 10. 1 being the lowest score and 10 the highest. It is a combined estimate of the quality and relevance of both your ads and your landing pages. Relevant ads get more clicks, and so Google earns more money. But it is also important to have relevant ads to give the customer or searcher a great experience. It would be annoying if you couldn’t find what you were looking for on Google. Checking quality score can be done in the Campaigns tab, at the top. Click this then select the Keywords tab. Click the speech bubble next to the keyword’s status – this should show you the quality score. Having higher quality adwords (and better performing landing pages) can often lead to lower cost per click, and can improve the ad’s position. To increase quality score – group keywords by specific themes, make sure the ads are relevant and the landing page is also as relevant as possible. If you are advertising for a product, make sure that product has a specific landing page. Google also says on their tutorial page that you should make the keywords as specific as possible, using ones that are often several words in length. Include a call to action such as “Buy now” “click now for more info” etc. Increasing your click through rate not only increases traffic to your website, it also increases your quality score. You need to ensure that you known what you target audience actually looks like (age, gender, location) and do your keyword research. When you are attempting to increase CTR, remember that ultimately you are looking to increase your conversion rate (amount of times a click results in a sale). If an ad has a high CTR, then great, but does it convert well? Make sure you are getting the correct traffic, experiment with ads and make sure that CTR is focused upon, but not the detriment of conversion percentage. – To increase click through rate however, you can look to keep ad groups very specific. – Use ad extensions – including sitelinks extensions and location extensions. The tool will then manage your bidding and generate keyword suggestions. You can add in negative keywords easily, split test ads, etc. – If you quality score is low, think about giving the ad its own ad group and landing page. – If you have no profit after 500 clicks or so, delete the ad. – Once the campaign is profitable and running smoothly with a good ROI, think about increasing your budget.